The Life of LeeshaStarr: Good news & discount code!! Good news & discount code!! Like promised I am sharing my good news with you all. I got a new job, well a 2nd bar staff job! I'll be working at festivals across the UK & Ireland. 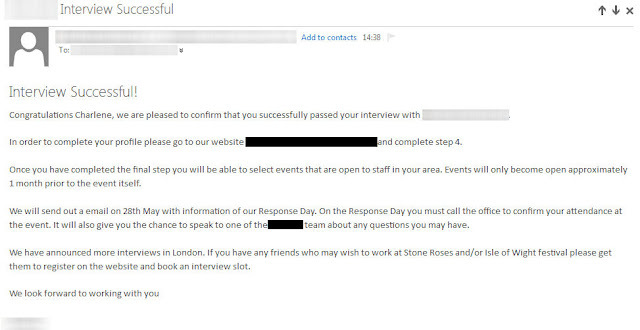 I am looking to work V Festival, The Isle of Wight Festival & The Stone Roses. I am so excited and can't wait. I am so excited, I got an email about getting a veet device (all of the above items) to try and review. I love waxing (I am a beautician) and can't wait to get the item. I'll write a full review on my blog but if you'd like to try it I can give you a 50% off Amazon code. Click here then enter the code EASYWAX4. You should “Like” Veet® on Facebook for official updates from them. I am so happy to be a BzzAgent. Have you seen the advert on the TV? I get excited each time I see it. Wish me luck! Rules of the discount code. This promotional claim code expires on June 30, 2013 and is specific to a Veet® EasyWax™ Electrical Roll On Kit and can only be redeemed against this item while stocks last. This promotional claim code must be redeemed at Amazon.co.uk and cannot be redeemed at Amazon.com, Amazon.de, Amazon.fr, Amazon.ca, Amazon.co.jp or at Amazon.co.uk Marketplace or at any of Amazon.co.uk's Trusted Partner sites. The promotional claim code cannot be used to pay for Amazon.co.uk Gift Certificates. The promotional claim code has no cash redemption value and is not transferable or assignable. If the order exceeds the amount of the promotional claim code, the balance must be paid by credit or debit card. Please use the Shopping Basket rather than 1-Click ordering method when paying for an order with the promotional claim code. Normal Amazon.co.uk terms and conditions of purchase and for using the Amazon.co.uk website apply. This promotional claim code may not be used along with any other and is limited to one Veet® EasyWax™ Electrical Roll On Kit per basket per customer.